← Queen – Modern Times Rock’n’Roll. Queen – Son And Daughter. Publicat pe 20 mai 2015	de Cristi M.
In July 1973, Queen finally under a Trident/EMI deal released their eponymous debut album, an effort influenced by the heavy metal and progressive rock of the day.The album was received well by critics; Gordon Fletcher of Rolling Stone said „their debut album is superb”,and Chicago’s Daily Herald called it an „above average debut”.It drew little mainstream attention, and the lead single „Keep Yourself Alive”, a Brian May composition, sold poorly. 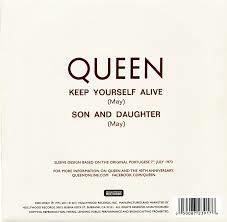 Retrospectively, „Keep Yourself Alive” is cited as the highlight of the album, and in 2008 Rolling Stone ranked it 31st in the „100 Greatest Guitar Songs of All Time”, describing it as „an entire album’s worth of riffs crammed into a single song”.The album was certified gold in the UK and the US.